RAIN drumming on a flysheet. Condensation dripping on damp clothes. Another day begins in the Highlands – a day with clouds hugging the treetops and few prospects of fine mountain scenery . . . So I go for a drive. 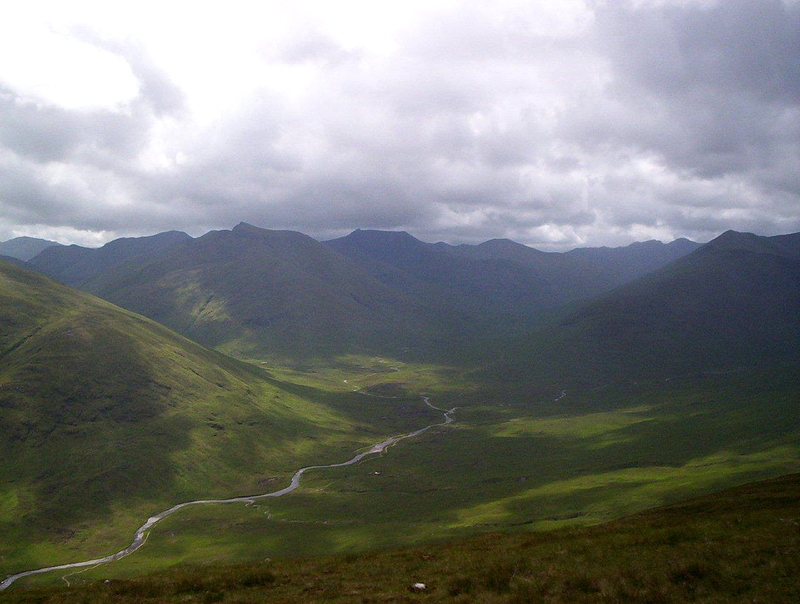 I head over the Cluanie Pass from Glen Shiel and take the narrow road to Kinloch Hourn. I tell myself this is a fitting alternative to a walk on the hills because it can be regarded as a reconnaissance trip for an expedition into the wilderness of the Knoydart peninsula. At Kinloch Hourn I sit in the car while rain falls steadily and windows steam up. Then, on the slow and winding drive back, the rain begins to ease. When I reach the Cluanie Inn, at about 2pm, I see white cloud through cracks in grey cloud and the occasional shaft of sunlight. So I lace up my boots, sling my sack on my back, and head off along the valley of An Caorann Beag in the hope of salvaging a few remnants of the day. And as I climb the slopes of Ciste Dhubh (979m or 3,211ft) the clouds roll back and sunlight streams across the world. The day is reborn in a matter of moments. Grass has never been greener, air fresher, clouds whiter, sky bluer. A terrific wind roars out of Glen Affric. Small birds dance above the stony summit. I sit there with the sun on my face and wind snatching at my clothes, gazing out across a vast wilderness that stretches to every horizon. Ciste Dhubh is a small mountain tucked away behind spectacular peaks. But this afternoon it is the centre of the universe. It is the most perfect mountain in a perfect world. Ciste Dhubh and days like this are what living is about. 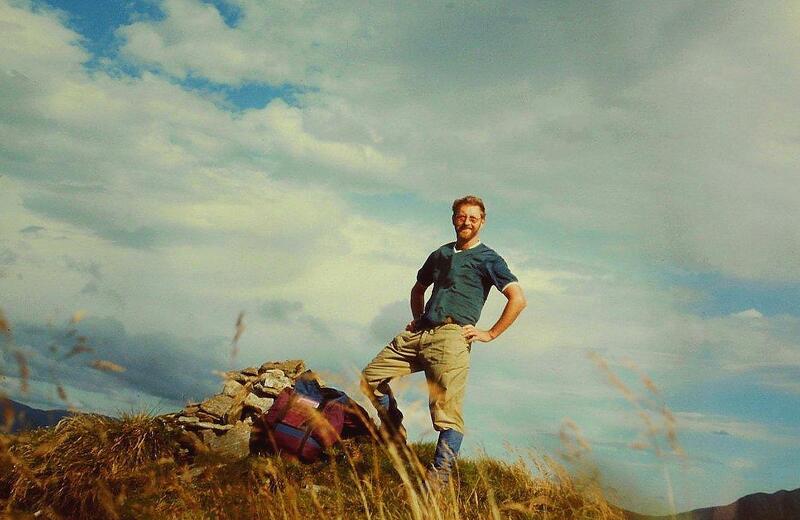 This entry was posted in Camping, Climbing, Hiking, Mountains, Walking, Weather and tagged Munros, outdoors, Scotland, The Munros. Bookmark the permalink. As always, a wonderful post. Of course, jewels should never be on display, like some sort of bling, but best discovered slowly, tentatively & savoured for the longest time. Hi Ash. That’s the trouble with writing about good days and fine mountains. There’s a line of thought that the Lake District would be a much quieter and more natural place if Alfred Wainwright hadn’t published his guide books. But there you go. Absolutely terrific picture and words that brought back a lot of memories. Hi John. Thanks for that. Ciste Dhubh isn’t much in the scheme of things but it remains one of my favourite mountains. Alex, you could do a mountain challenge. 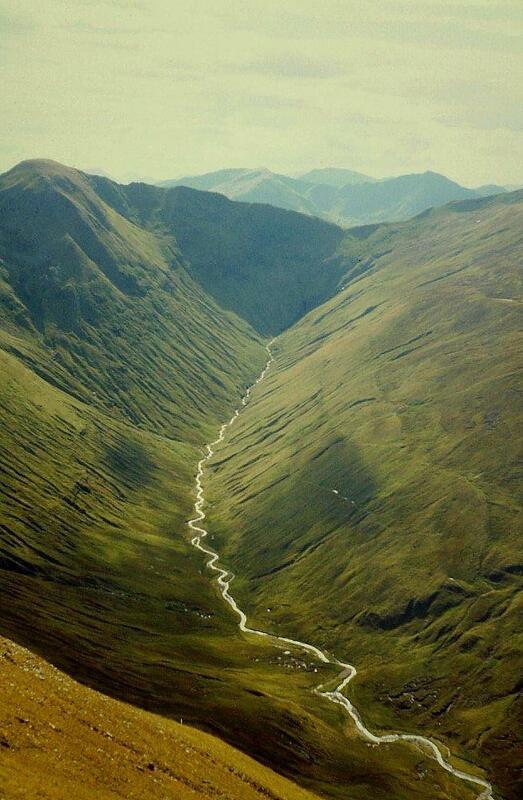 You could get in the Guinness Book of records as the first person to do all the Munros on a bus pass. What a great blog it would make. Camban Bothy is a bit basic, even by bothy standards, at least it was the last time I was over there. Earth floor and stones to sit on. Good enough for poor folk, I suppose. that hill scared me silly! Your first photo pretty much illustrates why – that awful steep slope 3000 + feet all the way down to the valley – eek! I’m going to have to have another go at it now I’ve moved up a notch to see if I’m still scared of it. Richard wants another go at it too as I insisted we leave the summit immediately I touched the cairn and then fled off down the grass between the crags rather than do the narrow ridge back! Great first photo though – even if it does look a long way down! Hi Carol. 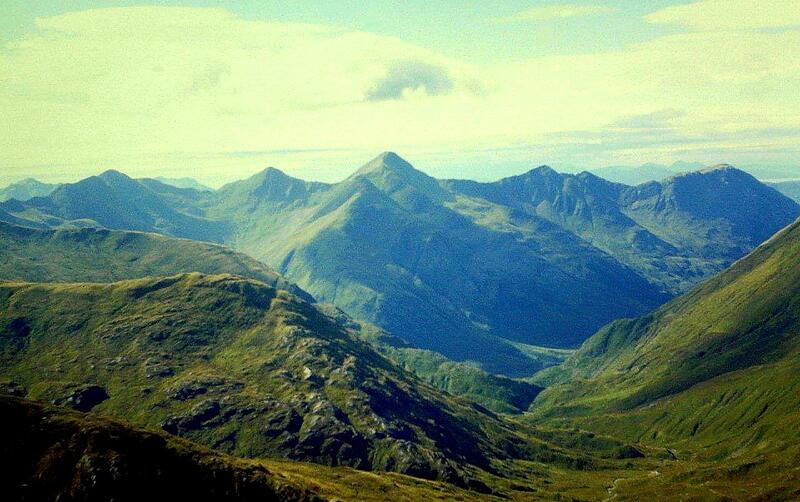 Did you climb Ciste Dhubh from the Glen Affric side? Because it looks much steeper that way. I came in from the south from Loch Cluanie and it’s a gentle though somewhat boggy stroll with a pleasant section of airy ridge just before the summit. Just the job for an afternoon outing. Sorry to hear about the bus passes. Perhaps we should be planning ahead and looking at mobility scooters based on quad bikes. Ha ha. P.S. and you’re keeping as late hours as me now! Ha ha. My mate got an electric bike when he was made redundant about five years ago and sold me his tailor-made Young’s racer for £50. But he got fed up with it and got another racer instead. Lovely story, Alen. I enjoyed it very much. I looked in Google topographic terrain. 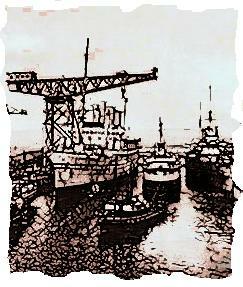 It reminds me of the west coast of Norway, with long fjord arms and steep mountains. It must be a great place to be. Isolated and very far away from residential areas. What kind of vegetation is the there on the mountain? The highest point is 979 meters above sea level. Do they grow where you walk the berries? Hanna, if I recall correctly the vegetation mainly consists of heather and bog plants. The walk along the valley is very boggy, and there is a plateau below the summit of Ciste Dhubh which is crisscrossed with peaty streams and is very wet underfoot. It is a typical Scottish upland peat bog. The summit ridge is pleasant and grassy, with areas of tougher vegetation that might well support bilberries – or blueberries as they are otherwise known. Over the ridge in Glen Affric there are ancient forests of Scots pine. And that’s about the total of my plant knowledge. If I said any more then I would be making it up. Oh, but there is a bannock forest at Auchtertyre just up the way on the side of Loch Duich. I have no plan follow the footsteps of you or Carol. I haven’t got that much glue to go with my boots. Normally I travel lightly. I think Norway must have more berries in its uplands than Scotland, Hanna. perhaps the sheep and deer eat them all over here. I have not heard of that book but I shall keep my eyes open for it. It sounds like my sort of read. If I come across a copy I’ll mail it to you. Hi Alen, Wow, that first photo is stunning by anyone’s standards, however long ago it was taken. What a view! Certainly well worth that decision – but it sounds like a gruelling climb, from the comments! I’m haven’t done many of the Munros but I know the feeling when you are up on the tops is just amazing, worth the sunburn and the aching limbs. Fantastic! Hi Jo. I think I’m going to have to go back because I don’t recall any scary bits. It was just before I got some new glasses, so perhaps I didn’t see them. But it’s a great mountain and just the job for a not-too-hard day on the tops. I can thoroughly recommend it if you’re in the area. The Cluanie Inn is very handy too. Marvellous. It has however brought back embarrassing memories of the day me and my hillwalking buddy who shall remain nameless – Andy – drove all the way to the Cluanie Inn from Airdrie; sat in our car with our windows steaming up looking at the rain; didn’t fancy it at all so bravely repaired to Fort Augustus for lunch. By which time the sun was splitting the trees. And if you’d sat in the car for another three hours or headed off into the rain, it would have only got worse. There must be a law – along the lines of Newton’s, Boyle’s and Ohm’s laws – that determines the outcomes of situations like that. Gnarly’s a great word. I have no idea what it means but it sounds like a word that has attitude.